Discussion in 'Showroom' started by Mr. Cat, Nov 26, 2018. Sonic Eclipse is a Sonic 2 8-bit hack for the Sega Master System. Our main goal is to show that it's possible to make a 8-bit hack as full fledged as any 16-bit hack, and our first demo features one complete Zone and a Hub world with new Layouts, Art and Music. We hope you enjoy our hack! NeoFusionBox, Calvin, AsuharaMoon and 14 others like this. Bluestreak and Mr. Cat like this. I had a lot of fun playing this. The artwork looks fantastic under the limitations, the music is pleasant to listen to, and the layouts had lots of little secrets and hidden paths to them. Thank you for making something enjoyable, that also caught me by surprise. NeoFusionBox, Bluestreak and Mr. Cat like this. I'm not sure what it is with the sms contest/expo entries, but Fusion just brings up a "software error" message when I try loading any of them; it's really annoying as I love playing sms games and hacks. KosmoF they play perfectly on my version of KEGA Fusion (3.64), but maybe I am just lucky. Anywho, masterful work here. Having you start at Underground and fall down a hole to a strange warp thing was shocking. The Hub looked more like what Sonic Blast shoulda looked like, almost looking pre-rendered. Crystal Coast reminded me a lot of Angel Island from Sonic 3, and how Mr. Cat pulled off it going from a dense jungle to a seaside was incredible, and well-done use of palette trickery and creativity with tilework. The new music was a great treat. I thought I'd never see an SMS Sonic 2 hack with new music. The ending was also a real treat. 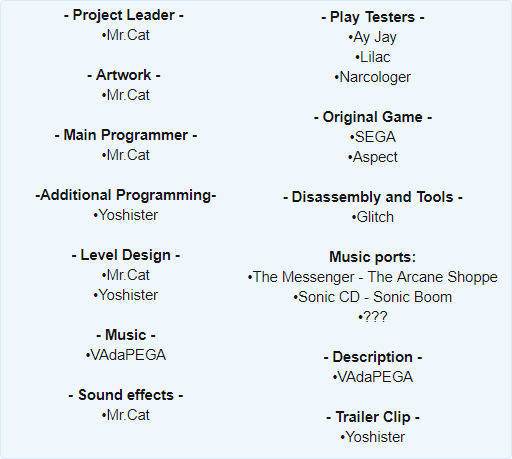 Mr. Cat, Vadapega, and Yoshister are the masters of Master System hacking, and make an amazing team. Mr. Cat and ProjectFM like this. maybe you could use a different emulator like Gens? That's really an awesome hack! Graphics are surprisingly well-detailed for a 8-bit console. Honestly, I didn't expect less from you! Also, SMS does what NES don't! It's the BIOS preventing you from playing the game I'm afraid. I think someone may have made a checksum fix for SMS games, though that could be my memory playing tricks on me. For now, if you're using a emulator disable the BIOS and the game will boot up just fine. By default all emulators, aside from MEKA doesn't even include a SMS BIOS by default. BTW great work to all involved!